A third episode of the Penny Arcade Adventures: On the Rain-Slick Precipice of Darkness is unlikely as ever, despite the series' newfound success on the Mac. The first two episodes of Penny Arcade Adventures are proving to be a big hit on the Mac App Store. So big, in fact, that someone at Hothead Games - the studio that made the first two episodes - got a little over-excited and started saying things that he or she shouldn't have and making promises the studio had no chance of keeping. The PA Adventure series was set in the 1920s in the fictional city of New Arcadia, and featured giant, fruit-loving robots, ancient mime gods and villainous clowns. The original plan was to produce four episodes, but sadly the series came to an abrupt end after the second, following weak sales and concerns that Hothead wouldn't be able to keep the quality up and work on Deathspank at the same time. For a short while, however, it seemed like a third episode might be possible after all. Episode One and Two both appeared in the top 100 best selling apps, at 21st and 56th respectively. Hothead tweeted how thrilled it was that the games were doing so well, and then followed that tweet up with another - which has since been removed - that said that if 100,000 people bought both episodes, then it would make a third episode happen, no matter what it took. This came as news to a lot of people, not least the folks at Penny Arcade. Artist Mike Krahulik refuted the Hothead tweet with a tweet of his own, and head of business development Robert Khoo said in a statement that there was nothing new to say about the games. Hothead president Vince Ceraldi confirmed that the tweet had been a mistake and dismissed the idea that high sales would prompt a third episode, saying that the future of the games was uncertain and that it wasn't as simple as hitting the right number. It seems pretty unlikely that the final two episodes will ever appear, as Krahulik found the process of making the games rather unsatisfying. 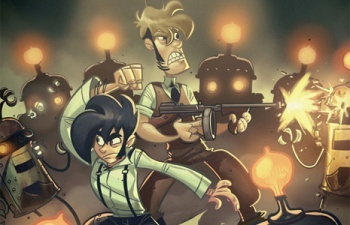 Krahulik, along his writing partner Jerry Holkins, instead decided to continue the story on the Penny Arcade website, which is where it seems destined to stay.